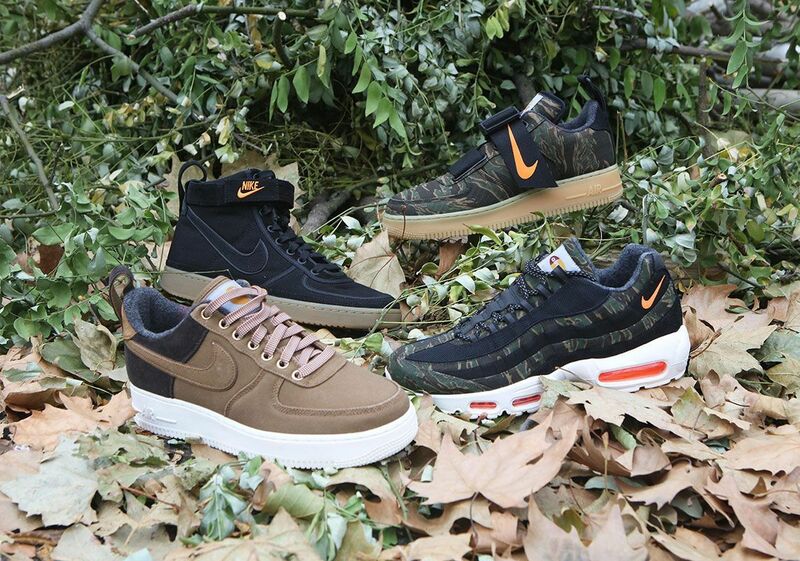 Where to cop the Carhartt x Nike fall collection. Carhartt WIP and Nike will launch their collaborative fall sneaker collection today, including the Air Force 1 Low, Vandal Supreme High, Air Force 1 Low Utility and Air Max 95. Each of the four Carhartt WIP x Nike sneakers will drop at 10am ET. The kicks will be available at most major retailers. Check out some purchase links below. For this collection, core Carhartt WIP (Work In Progress) materials, such as Dearborn Canvas in Hamilton Brown and black and Camo Tiger Ripstop. The Carhartt x Nike Air Max 95 is built for the elements, featuring a camo print throughout the black upper, as well as a white midsole with orange detailing in the Air unit. Additional details include boot-like, spotted laces and the Carhartt logo on the tongue. The Vandal High comes in a black canvas with a gum sole, while the Air Force 1 Low features a Hamilton Brown canvas. Lastly, the Air Force 1 Low Utility comes in a Camo Tiger Ripstop, complete with a black strap, orange Nike swoosh and gum midsole.